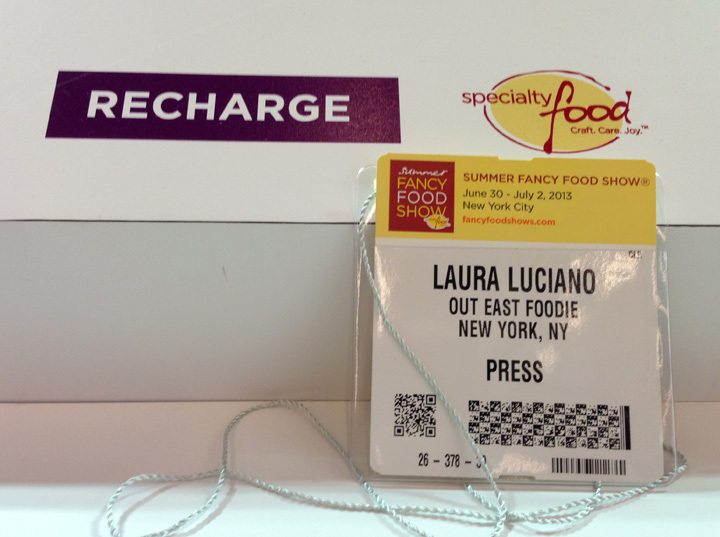 Imagination, wonder and daring to dream big were prevalent at the The Summer Fancy Food Show in New York City; a three-day specialty food smorgasbord featuring food and beverage artisans from around the world. 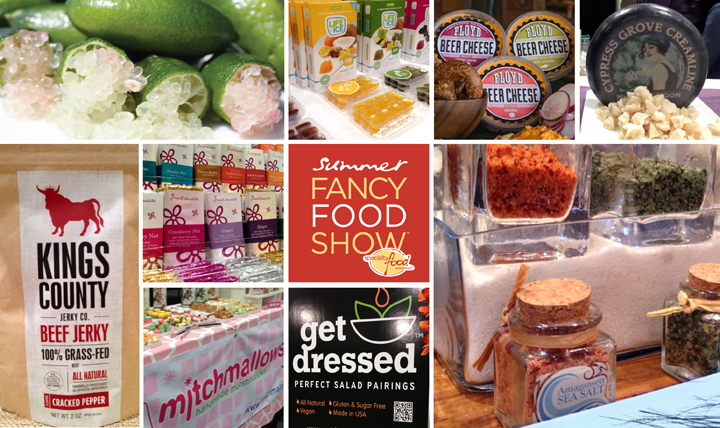 With over 2,400 vendors from more than 80 countries showcasing 200,000 products, it was a foodies edible wonderment. I was only able to attend the last day of the show and focused on local-New York products, however I have a few notables outside of the Empire State. I had my day cut out for me sampling: beverages, cheese, confections, sauces, spreads, and seemingly everything in between; it was a Pepcid AC commercial in the making. My day started with the “New Brands on the Shelf Pavilion” featuring 34 emerging food entrepreneurs, who exhibited their products for the first time at a Fancy Food Show. Mingling and munching down this aisle was by far my favorite; hearing the stories of these passionate artisans was truly inspiring. Chef Dave Martin was a contestant and finalist on the first season of Bravo’s Top Chef in 2006. I had the honor to cook with Dave at a corporate event a few years ago where I was impressed with his sauces and marinades. It is no surprise that in 2012 he launched Dave’s Homemade, a company that produces small batch artisanal sauces and rubs along with a two-volume set of cookbooks for the home cook. The Ooey Gooey Caramel Sauce is not-so-sweet, made with maple syrup and sea salt; a great sauce for any dessert. Dave is offering 10% off on his products online; simply provide the code ffshow-10. In 2004, Floyd, NY beer bar opened in Brooklyn, New York. Due to the law they were forced to serve food to keep their beer passion going and glad they did as their Kentucky inspired beer cheese is something to taste. Beer cheese is a southern specialty made from sharp cheddar, quality beer and a unique blend of herbs and spices. My first bite of the show was their original flavor. This was by far my favorite; the beer flavor undertones were balanced beautifully with the sharp cheddar and traces of pimento. Vanessa Miller is a native New Yorker and a teacher who brought her blackboard way of business thinking to her black labels for her Get Dressed Salads. "The blackboard represents getting started", she said. Her product got its first start through Indiegogo, a crowdfunding platform. She speaks four languages and ironically enough has four dressing to boot; Ginger Gem, Perfect Pepper, Lemon Love, and Va Va Voom Vinaigrette. Vanessa is interested in dressing salads to enhance ingredients, not drown them. My favorite was the Ginger Gem, subtly spicy and silky. Out of tragedy comes triumph and it is so true for the founder of LifeIce, Paulette Fox. In the summer of 2010, the idea for LifeIce was born out of recipes Paulette made to comfort, hydrate and nourish her mother, who had been bravely battling ovarian cancer. She began blending and freezing flavorful batches of “nutritional ice chips” for her mother who lived beyond doctors’ expectations, giving extra days for Paulette to be with her mother. The 100% natural product is an innovative freeze-and-eat treat that is gluten-free, kosher-certified, GMO-free, fat free, low in calories and sugar. It comes in four distinct flavors: Berry Bite, Chocolate Crisp, Citrus Chomp and Green Grind. The base of LifeIce is coconut water and agave. LifeIce is not so sweet and the flavors are smooth and soothing. I can see this product in a beverage as a fun cocktail as well. Help LifeIce raise awareness for ovarian cancer. Mitchell Greenberg is the founder of MitchMallows, handmade marshmallows. Mitch is a set-designer and it is no surprise as each marshmallow was a character unto itself; Churros, Ginger Wasabi, Pretzels Beer, Banana Split, Watermelon, Mallopolitans and Creamsicle. The Ginger Wasabi was spicy and sweet; a unique marshmallow I can see in a hot chai tea latte. 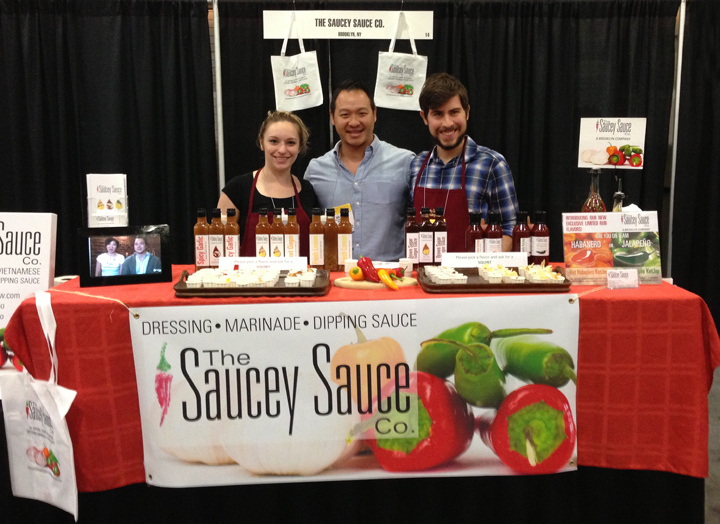 The sister and brother team Toan and Ken Huynh founded the Saucey Sauce, Co. They started serving their mom’s recipe at dinner parties in Brooklyn, NY and realized they were on to something when friends started asking for bottles to take home. Ultimate Sauce line: Spicy Garlic, Fresh Lemon and Sweet Ginger Sauce. Limited run flavors: Hot Habanero KetJap and Sweet Jalapano KetJap. The sweet and savory taste of the Sweet Ginger Sauce was my saucey star; a sweet balance of brown sugar and ginger. This would make for a great marinade on chicken, pork or salmon. I love green juice and this product is worth mentioning as I thought it was cleaver, healthy and delicious. For Dee Ann Bauer, a mother or three, she was always looking for ways to sneak greens into her children’s meals. Dee Ann and her daughter began experimenting on ways to develop a nutritious green smoothie blended with leafy greens and fruit. Once they discovered how delicious the smoothies were they developed a farm-to-freezer healthy pop and Green Wave Smoothies was born. These frozen pops are offered in two flavors: Kalelicious and Greena Colada. Both flavors are naturally low in calories and sweetened with fruit. If you live in the area Charleston, South Carolina you can find their product at the Charleston Farmers Market. Some sections at the show were broken out into states and countries. Brooklyn had a large presence and was part of the Brooklyn Chamber of Commerce that promotes food and drink entrepreneurs. Long Island had a small turn-out; I was happy to see our East End Long Island neighbors, Natalie and Steven Judelson of the Amagansett Sea Salt Company there. Long Island was represented by Natalie and Steven Judelson, the founders of Amagansett Sea Salt Company. Their artisanal sea salt is made entirely by hand in small batches from seawater, directly harvested from the Atlantic Ocean, then filtered, solar evaporated, and packaged. Ocean-to-bottle takes place in Amagansett, a neighbor that I need to visit in the near future. I have used their Montauk blend that is infused with lemon zest on seared scallops that complements the sweet scallop flavor. I am particularly looking forward to using their new Southampton blend made with Madagascar Vanilla bean for finishing off brownies or even a sprinkle on top of butter poached lobster. Michael Rogak is a chocolatier and his family business has been making chocolates since 1946. Michael has embraced the new food age in Brooklyn and is enthusiastic about the food entrepreneurs that are making a living in Brooklyn. On display was beautifully wrapped candy bars and their butter crunch toffee with toasted almonds was melt-in-your-mouth good. JoMart is offering 10% off their online and in-store products during the holiday months of November - December. Mention out east foodie for this exclusive offer. Two best friends, Jessica Quon and Sabrina Valle began making Jam in their apartment kitchen in Williamsburg, Brooklyn. They wanted to create a food company that was a true reflection of themselves and their community. Their Jams are uniquely flavored and the fresh fruit is sourced from local farms. My favorite flavor was the Drunken Monkey Jam, made with bananas, lime and rum; this will be my topping of choice the next time I make pancakes. This 100% Grass-fed beef Jerky was exceptional; hands down my most memorable Brooklyn vendor at the show. Jerky flavors offered: Cracked Pepper, Korean BBQ, Sichuan Ginger and my favorite the Mexican Mole that had rich chocolate undertones and a fine balance of spices. Added bonus, Pasture-raised & non-confined, no antibiotics or added hormones and is low in fat, sodium and high in protein. Slowbaked and handmade Rye Bread that takes more than 38 hours to bake a single loaf. 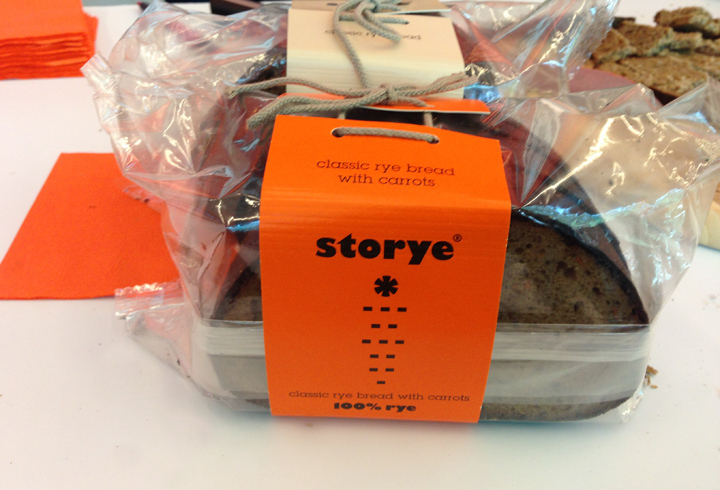 Anything with the word slow in front of a food craft is going to be good if not spectacular; Storye Bread is a true slow-craft. Their Rye Breads are: Classic Rye, Fine Rye, Fine Rye with Fruit & Nuts and Classic Rye with Carrots. I enjoyed each one; wheat-free, GMO-free, has 9 grams of fiber and is made with only rye grains grown in Northern Europe. A hearty and healthy bread worth trying. In 1970, Mary Keehn, single mother of four children living in Humboldt County began looking for a healthy source of milk for her family. By obtaining two goats from a neighbor, she milked the goats for dairy and over the years experimented with the craft of making cheese. Since 1983 Cypress Grove was born and has been a leader in the domestic goat cheese market and internationally awarded for the excellence of its products. Their artisan goat cheese lines are exquisite, in particular their sofi award winning Humboldt Fog, for classic cheese category. This has a subtle, tangy flavor with floral notes and would be lovely with a drizzle of honey. The Midnight Moon is aged six months; dense, smooth with a nutty caramel finish; this on a cracker with some quince paste would do me just fine. This product was most unique; imagine the interior of a “finger lime vessel” that is packed with citrus caviar and when you cut it in half and squeeze, the finger lime releases individually contained juice vesicles that pop with a tart lemon lime flavor when bitten into, extraordinary. 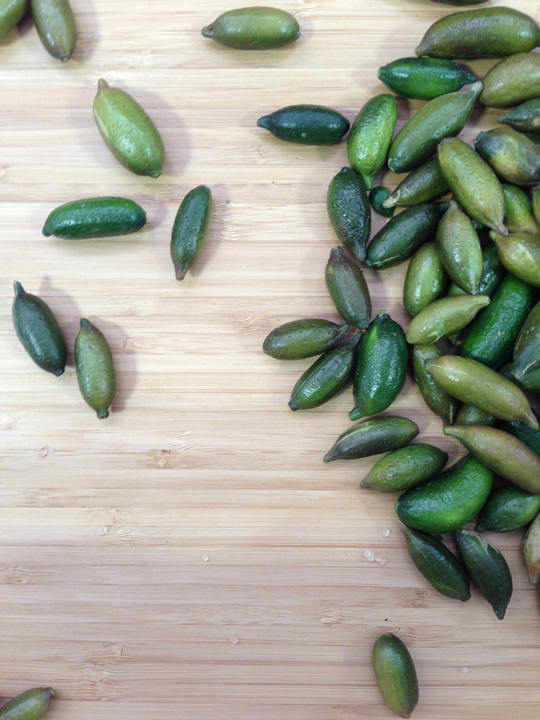 According to Jim Shanley, owner of Shanley Farms it took six years before the Finger Lime trees bared fruit. I can see this product used in a variety of ways, in particular on the rim of a margarita glass, how cool! Jim Shanley and his daughter Megan run the family farm business. They bring to market Citriburst Finger Limes, Morro Bay Avocados, and Sierra Sweet Kiwis. The sofi Award is the highest honor in the $86 billion specialty food industry; “sofi” stands for Specialty Outstanding Food Innovation; and is awarded to the best of the best in specialty foods and beverages from members of the Specialty Food Association. 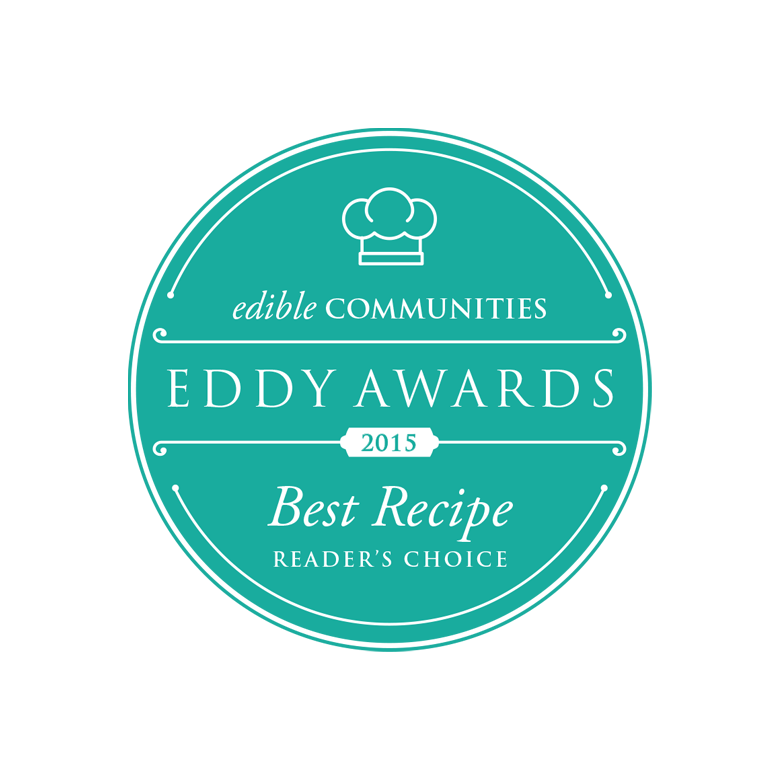 The awards were presented at a red-carpet ceremony hosted by internationally-acclaimed chef Marcus Samuelsson. Getting this prestigious award is like receiving an Oscar for best actor within a category. You can view all of the sofi awards and finalists here. Getting around this show in a day was an amazing food race. Next year, I think the full three days would suit me and my stomach well. Dan's Taste of Two Forks was Hot!